At only 9" long, but with 22% more LEDs this undercover, interior dash, deck, mirror or suction cup light, The Star Mini Phantom is a great bang for your buck! The Mini-Phantom is extremely small, extremely lightweight, and extremely bright! 66 long-life LED's are what make this light what it is. The unique curved design lends itself to easy mounting and less flash-back. Conveniently, it's low power draw won't compromise your electrical system, either! The light is a great choice for undercover, unmarked, or firefighter vehicle applications. Available in single or dual colors. Choose Amber, Blue, Red, Red/Blue, Blue/White, Red/White. 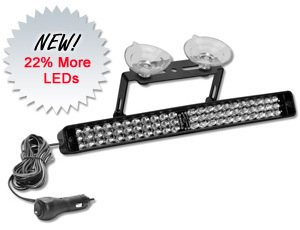 Interested in this great selling light now featuring 22% more LEDs? Then check out even more of the nitty, gritty details on our information page, here.